When I welcome new students to my yoga classes, the first thing they want to know is what it’s going to do for them. “Will I lose weight?” “Will it end my depression?” “Will it fix my ADHD?” I tell them yoga can help many health conditions, but I’m careful about repeating pop-culture pseudo-science that suggests yoga is a cure-all. Before I tell my students something is going to ease their stress or help them slim down, I want to see the research. You see, I teach at Bennett, a historically black college for women. Almost all of my students are black. Our students are more likely to be negatively affected by the psychological and physiological impact of “Living while Black.” As women, they’re worried about their fathers, brothers and boyfriends being targeted. But they themselves are in the crosshairs as well. The public health community has finally acknowledged that this kind of chronic stress can, for some, rise to the level of racial battle fatigue and race-based trauma. This may make our students, and African Americans in general, more prone to certain cancers, heart disease, diabetes, poor birth outcomes and other conditions. If anyone needs a cure-all it is students like mine. Could yoga help? I can’t say for sure whether the benefits of yoga extend to my students because the research doesn’t include them. Why not? For one thing, researchers don’t seem to mind using a homogenous sample—say, all white males—and assuming the outcome applies to African Americans or women. Women’s heart attack symptoms and girls’ attention deficits went ignored and untreated for years until someone realized their symptoms didn’t look like the guys’. What about the researchers who “can’t find” black research participants? They are searching in vain if they’re looking for us in typical yoga spaces. Anyone who has ever unfurled a mat in the average yoga studio knows that they are some of the whitest places in America. That doesn’t mean that black and brown people aren’t practicing yoga, but they may not be doing so in the expected settings. If these issues aren’t addressed, studies will continue to be mighty white—and potentially fail to accurately assess yoga’s effectiveness for people in other demographic groups. Assuming that the effectiveness of yoga for white populations also applies to black people is to ignore the unique experiences that impact black health. Could yoga ease our pain and improve black health? We have to find out. That means black people and other diverse populations have to be represented in the pool of researchers, among research participants and even in framing the research questions that are being examined. Some researchers have begun to do this. 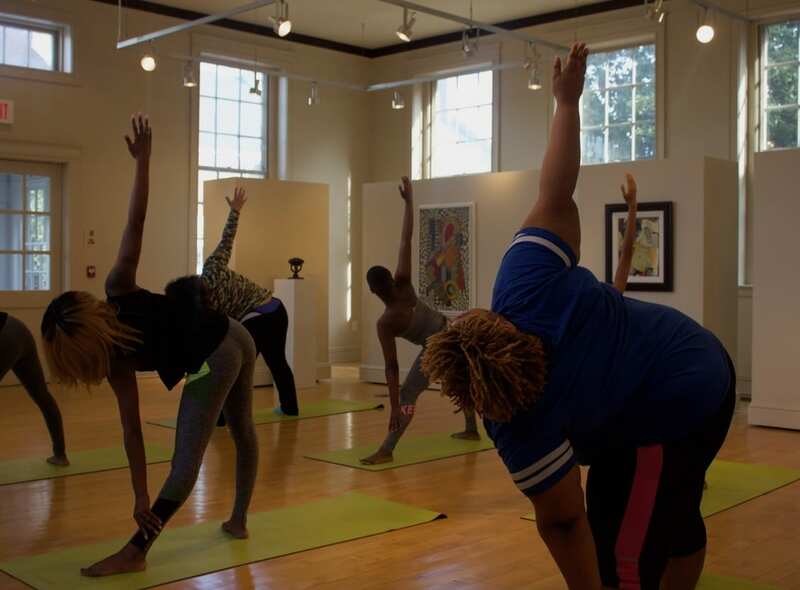 A team at Loyola University Chicago is looking at how African-American women perceive yoga as a way to address stress. At the University of Minnesota, Daheia Barr-Anderson’s pilot study hints yoga’s potential to address stress, hypertension and obesity. At Bennett, my colleague, social psychologist Santiba Campbell and I are investigating the effectiveness of what I call Whole Yoga, a practice that includes yoga postures as well as breathing exercises, meditation practices, and lifestyle approaches. We want to understand the impact of yoga practice on their perceptions of health. We’re also addressing the barriers that may keep them from practicing yoga, including issues of religion, language and culture; body image and body type; and economics and access. We’re also expanding the community of black women who have been introduced to yoga and mindfulness practices. Since the class was added to the curriculum in 2016, I’ve taught more than 300 students (on a campus with an enrollment of about 500). That is not counting the Black women from the community who come to special pop-up yoga sessions. Opening the door to yoga empowers them to discover its benefits for themselves. Another thing I tell my students on day one is that yoga is personal. What one woman gets from her practice may differ from what someone else experiences. If you feel better after yoga class, you don’t need a clinical trial to tell you that. But in order for us to understand its impact on communities of color at large, the research has to include more black and brown people—and look at their practice and their outcomes through the lens of their unique cultures. For that to happen, researchers are going to have to make stronger effort to include African Americans, Asians, Latinx and Indigenous people in their studies. Tamara Jeffries, an Associate Professor of journalism at Bennett College, is a former Executive Editor at Essence. She writes about health for national, local and special-interest publications, and is a thought leader around issues of diversity in yoga. Is a series of conversations with women of color to present the overlooked and often missing viewpoint about the ways research and policies address our well-being. "You can't assume that a number tells you about the experience that women have had and are still having"